Just imagine what would happen if all of a sudden your system would crash and you would lose all your Outlook information. The safest way to protect your data is to create regular backups of your Microsoft Outlook data (emails, calendar entries, contacts, etc.) and keep these on removable media (i.e. external drives, Blu-ray/DVDs) or in the cloud (i.e. Google Drive, Dropbox, Amazon S3). With Backup4all is very easy to back-up your Outlook data. Almost all of the data for Microsoft Outlook is stored in Outlook Data Files (.pst) and offline data files (.ost). In Outlook 2013 and earlier versions, IMAP accounts were also stored in .pst files, however starting with Outlook 2016 and Outlook for Office 365, IMAP accounts use Offline Outlook Data Files (.ost). Microsoft is using the .ost files (Offline Outlook Data file) to store a local copy of the emails for IMAP accounts. Backing up the OST files is needless and we don't recommend it. Even if you would backup the .ost file you wouldn't be able to restore it and recover the emails from the .ost. If you want to have a backup of your emails from an IMAP account, first you'll need to create a local copy of the emails (drag-and-drop them into a local Outlook folder from your IMAP's Inbox) and then you can back-up the resulting .pst file. This is the Microsoft position regarding .ost files: "Maintaining changes to OST files within shadow copies is expensive in terms of space and I/O activity. The time-consuming work at backup time is backing up the OST files as part of the image. Everyday I/O will write to the OST file when Outlook is running. So the backup process will impact the performance on the computer. If the OST changes were kept in shadow copies, then Outlook writes to the OST files is copy on write I/O hit (2 writes, 1 read)every time. Even though we have worked to reduce the impact of copy-on-writes on shadow copies, a heavily churned file such as OST file still cause problems on the computer. In addition, the OST files can be regenerated. We delete OST file from the shadow copy before the image is created. For example, after restoring an OST, the computer detects a new version of the OST file on the computer, it will force you to delete, and the regenerate the local OST file. Therefore, it is still preferable to regenerate an OST file instead of restoring it." 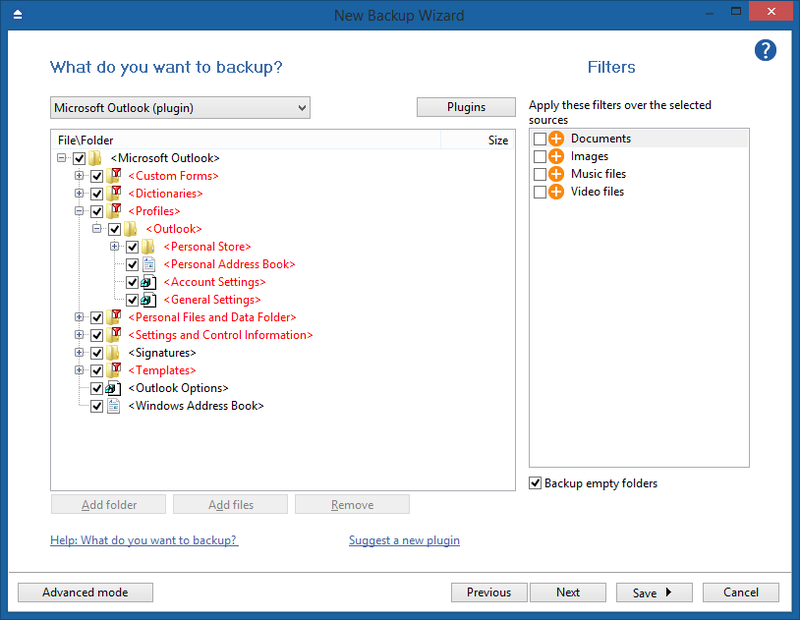 Backup4all is a backup program that lets you backup Outlook automatically. Basically, you just have to define a backup job where you define various settings (such as where to keep the back-up, when to run the back-up, what type of backup to use) and that's it, Outlook will be backed up regularly (if you choose to schedule it). Open Backup4all and select File->New (Ctrl+N). On the first page enter a name for the backup in the Backup Name field. Select a backup destination where you want to save your backup and press Next. On What do you want to backup page, click on the Selection of files and folders drop-down. This is a list of predefined backups, and you have to select Microsoft Outlook from there. Press Next. Select the backup type and encryption (optional) and click Next. Select how often you want the back-up to run and press Save. The new backup job will appear in the backup list. Click on Backup (F6) to start backing up Microsoft Outlook or leave it to run when the scheduled date you've set previously will be reached. Outlook data is stored in ".pst" files. For each mail folder defined in Outlook, a .pst file is assigned. These files get quite large if you exchange a lot of emails, thus when a small change occurs in a file (e.g. a new email has been received), the entire .pst will be marked as "modified". When running the backup, the whole file will be backed up as you cannot backup only the changes inside the .pst file. That's why it is recommended to do a full or mirror backup (and not differential or incremental). Also, it is recommended to limit the number of backups in order to save disk space. The easiest way to backup outlook is using a tool that automates the process as described in the previous section. However, if you want you can also backup Outlook manually by copying the files/folders to a specific destination. This has the disadvantage that it takes quite some time to find all the files, not to mention that in order to restore these you would have to follow these steps again. Below you can see the locations for the files/folders that need to be backed-up for different versions of Outlook. the VSS (Volume Shadow Service) is running and is properly configured If any of the requirements above are not met, Outlook will need to be closed before backing up the data (otherwise files that are in use will be skipped).